Love the title. You have some very strong compositional elements here. The guitar tilted at the diagonal of which the lines follow or nearly follow the opposite corners of the photo. The guitar slung on the back of this cowboy invokes the imagery of the 'singing' cowboy and the song "Home on the Range". 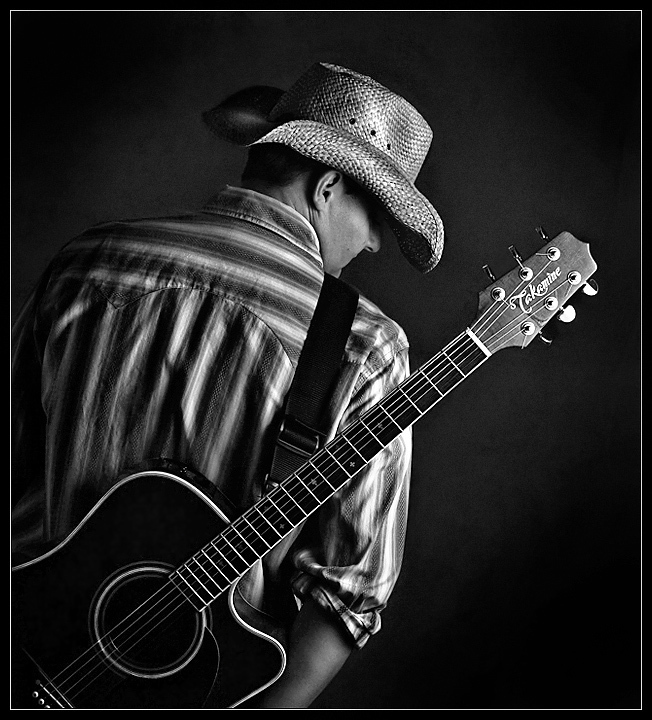 The B&W compliments the photo nicely for it helps us focus on the details such as the textures in the hat and the contrasts in the shirt and neck of the guitar. Really nice B&W tones in this one - very dynamic and not flat. Lighting is for the most part wonderful. My only two critiques which would have bumped this into the 8 or higher range is that I wish the cowboy had turned just enough so we would get a true profile - one that would not have his chin hidden behind the shoulder. The second is that the lighting be just a bit more under the brim of the hat to see the eye and the nose in the profile. Having a stronger side profile of this cowboy I feel would heighten the visual interest. Bumping up to a 7. Nice, well composed portrait that speaks about the person. Border looks great with it, too. Too Nashville, where there aren't too many cowboys in the city. Nice shot, though. Interesting and effective perspective. Love the black & white here. Title is perfect. Great job! good idea but I see the git dominating the shot. Great composition. Love the diagonal. :-) It's funny. The first thing I thought of when this image loaded is a country music singer rather than a cowboy. It's a very well put together photo with a strong composition and lines. Should do fine for you. Good luck. lol...I swear I only count 4 at the bottom and I see all six at the top. I guess the finer strings blend right in. Interesting take on the challenge. I have to admit that I don't really consider Bon Jovi to be country and Dead or Alive references his time on tour. On the other hand, I've been to a few rodeos where we sit around the fire at night and someone pulls out a guitar and starts to play. Aside from that, I like the black and white conversion. Overall, a nice shot that I am sure that will do fairly well in this challenge. Proudly hosted by Sargasso Networks. Current Server Time: 04/24/2019 11:50:47 AM EDT.